Someone once suggested that the enormous train stations located in the hearts of America's great cities were gifts from the railroads who built them. They have been lasting gifts in many cases and many that remain have outlasted any remnant of the companies who originally built them. 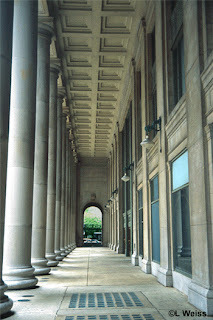 In 1925, Chicago's second Union Station was built through the agreement of five different railroads: The Pennsylvania; The Chicago, Burlington and Quincy; The Michigan Central; The Chicago and Alton; and The Milwaukee Road. The twenties were roaring and the bold station reflected the importance of the railroad companies in American society. The Pennsylvania Railroad proclaimed itself, "The standard railroad of the world" and the Milwaukee proudly billed the "Electrified" Olympian and Columbian passenger trains that left daily for the Northwest Coast.